The small Cornish village of Pendeen abuts rugged Atlantic coastland three miles (4.8 km) east of St Just. By popular account once a haven for smugglers, its interest to Vidimus readers lies in its barely-known collection of pre-1700 continental glass panels assembled by one of the foremost preachers of Victorian England – lauded by one admirer as the ‘Prophet of Pendeen’. 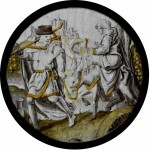 The glass collection is not described in William Cole’s Catalogue of Netherlandish and North European Roundels in Britain, Corpus Vitrearum Great Britain, Summary Catalogue 1, Oxford, 1993 and nor is it mentioned in the current (second) edition of Nikolaus Pevsner’s volume on Cornwall in the Buildings of England series. Fig. 1. Revd. Robert Aitken. Aitken was in his fiftieth year and had already had a colourful career in the church. He was ordained in 1823, but after a dispute with the Bishop of Chester, he moved to the Isle of Man where he was a regular preacher on the Methodist circuit and made many friends. He subsequently returned to the Church of England and became known throughout England as an evangelist of almost unrivalled fervour. One critic described the experience thus: ‘I thought I could distinguish very perceptibly an effort in the preacher to produce an animal excitement…. I could not divest my mind of the idea of a maniac’. Aitken had his largest following in Liverpool where his supporters attracted attention mainly because of their frenzied revivalist activities in the vaults of Hope Hall. It was standard practice for members of the congregation to rise up, dance and caper about the room, jump over the forms, tear their hair and clothes, and throw themselves on the floor. Apart his work in Liverpool, he also held positions in deprived urban parishes in Leeds and London, before becoming curate of Perranuthnoe near Marazion in Cornwall. Fig. 2. Church of St John the Baptist, Pendeen, Cornwall. Aitken was a tireless preacher, regularly in demand to speak at missions throughout industrialised urban centres. His creed was a combination of evangelism, stemming from his Methodist experiences of the process of ‘conversion’, and the sacramental beliefs of high church Anglicanism, known as Tractarianism. Whilst he was curate at St James, York Square, Leeds (1840–43) it became the only church in the city to have a weekly early morning communion, and he also established a quasi-monastic community there. Disputes over the place of such an ‘Evangelical-Tractarian’ within the established church lasted until well after his death. Fig. 3. Panels in window setting, s3. Unfortunately no records have been found of where Aitken bought his pre-1700 glass or how his gift was received by his parishioners. Aitken remained at the church (with occasional visits to the Isle of Man) until his sudden death on the Great Western Railway platform at Paddington on 11 July 1873. Overall the glass is of mixed quality. Without being able to inspect it in a conservation studio, it appears that some panels have suffered significant paint loss, perhaps due to their proximity to the sea. Other panels have been broken and repaired. In 2001 a fine image of the Adoration of the Magi was shattered by vandals. Notwithstanding such setbacks the collection remains interesting and important, not just as previously unrecorded continental glass in England, but for the light it shows on how such glass was perceived by a passionate clergyman of the period. Rather than arranged for any narrative or didactic function, it seems to have been used for its ability to infuse the new church with reminders of Christian history and to enhance its appeal and ambience as a place of worship and beauty. Fig. 4: window n7, panel a, The Presentation in the Temple, Germany, 17th century. Fig. 4. window n7, panel a. Fig. 5. window n7, panel b. Fig. 6: window s3, panel a, St John the Evangelist and St Agnes, Germany, 17th century, possibly repainted. Fig. 6. window s3, panel a. Fig. 7: window s3, panel b St John the Baptist and St Katherine, Germany, possibly 17th century but could be later. Fig. 7. window s3, panel b. Fig. 8: window s4, panel a, The Flight into Egypt, Flemish, 16th century. Fig. 8. window s4, panel a. Fig. 9: window s4, panel b, The Adoration of the Magi. Modern copy of the original, broken in 2001. Fig. 9. window s4, panel b. Fig. 10: window s6, panel a The Sacrifice of Isaac, possibly Flemish, 16th century. Fig. 10. window s6, panel a. Fig. 11: window s6, panel b, Christ as Salvator Mundi, probably German, 17th century. Fig. 11. window s6, panel b. Fig. 12: window s7, panel a, Lower half only of Christ carrying the cross, Flemish, 17th century. Fig. 12. window s7, panel a. Fig. 13: window s7, panel b, The Crowning of Thorns: design after Maarten de Vos (1532–1603), probably, Flemish, 17th century. Fig. 13. window s7, panel b. Fig. 14: window 8, panel a, The Prodigal son, Dutch, 17th century. Fig. 14. window 8, panel a. Fig. 15: window s8, panel b, St John the Evangelist, Flemish, 16th century. A similar example belongs to a private collection in Ghent (Belgium). Fig. 15. window s8, panel b.
I am grateful to Kees Berserik for his help with this item. Images 2–15 are © c b newham and reproduced with his kind permission. C. E. Woods, Memoirs and letters of Canon Hay Aitken with an introductory memoir of his father, the Rev Robert Aitken of Pendeen, 1928. On 30 December 2009 nearly 300 panels from the great east window of York Minster – in volume the size of a modern tennis court – came perilously close to being destroyed after a fire erupted in the offices above where they were being stored. The glass was made between 1405–1408 by the Coventry based glass-painter, John Thornton and is one of the greatest surviving masterpieces of medieval art in England. Master Glazier, Ian Tomlinson has worked for the York Glaziers Trust for nearly 40 years and played a key role in saving the glass. We are delighted to publish his exclusive eye-witness account of the events of that dramatic night. Most stories start the same way. You go to bed, the phone rings until you eventually wake up. You wonder who on earth could be calling you at 12.45 in the morning and just as importantly, why? Then you pick up the phone and listen and you know. Twenty five years ago the Minster was hit by a terrible fire. Now I was being told that fire had struck again, not in the church but in a nearby building where the glass from the east window was being stored. Fig. 1. The author inspects some of the glass for possible damage. I just threw on some clothes and scrambled into my car. The city was deserted. As long as the traffic lights were green and I could just keep driving I was focused. But when the lights turned red and I was forced to stop, I couldn’t help thinking the worst. Fortunately, when I arrived the scene was nowhere near as awful as I had feared. Fire engines filled the street and lots of people were moving around. Although I could smell smoke I could see that the building was still intact and that the fire was under control. Dr Richard Shephard , York Minster’s Chamberlain and Director of Development , and Canon Glyn Webster quickly told me what had happened. Simon Errington, a past Master of the Gild of Freemen of the City of York, was walking past the offices after an evening out in the city when he saw smoke wisping from a downpipe. At 11.24 pm he made a 999 call. Thank goodness he did. By the time the first fire appliance arrived the fire was taking hold and spreading. Flames were shooting through the office windows. The officer in charge quickly requested assistance. In all, over 30 fire-fighters and officers on 6 fire appliances and an aerial ladder platform arrived from York, Acomb, Huntington, Tadcaster, Selby and Easingwold fire stations. Fig. 2. Stonemasons moving the heavy racks. The fire had broken out in an upstairs office belonging to the stonemasons, directly above a large room where we had stored the glass from the east window a year earlier. A team of fire-fighters had entered the upper story to tackle the blaze. Although the fire seemed to be extinguished by the time I arrived, the glass was still at risk. Water from the hosepipes was pouring through a corner of the ceiling floor directly onto some of the glass. More dangerous was the possibility that the entire ceiling floor might collapse, burying the glass under a ton and more of rubble. Together with North Yorkshire Fire & Rescue officers, Group Manager Dave McCabe and station manager Jane Proud, we decided that it was imperative to move the glass to safety. Jane told her team that the glass was a national treasure which had to be saved. She was very passionate. I explained how it needed to be removed from the racks, carried to safety and stacked to avoid breakages. I found stiff boards to lay against walls so that the glass would not slip or buckle when it was stacked. The stone-yard manager Adrian Hodges, and York Minster policeman Steve Wilkinson provided invaluable support. Despite the conditions in the storeroom itself (dark, cold, and wet) and conditions outside, made doubly tricky by hosepipes snaking from appliances to the fire scene, the fire-crews were magnificent. With their help all the glass was moved to new locations in the stonemasons’ and carvers’ workshops as well as to the main hall in the adjacent Minster Choir School. From start to finish it took us about three hours to carry the panels to safety. When it was done I felt a huge sense of relief. It is a night I will never forget. Fig. 3. Transporting the glass to safety. What are my thoughts now it is over? Two stand out. I have worked for the YGT for nearly forty years. I remember the 1984 fire and the months we spent cleaning and repairing the famous 16th-century rose window glass in the south transept. Last year was the 25th anniversary of that terrible night. When I was forced to stop at the red traffic lights I couldn’t believe that history might be repeating itself. I never want to feel those fears again. My second memory is of the fire crews. Once again their courage and professionalism was exemplary. A few years ago Peter Gibson, who was my boss at the time of the 1984 fire, said he thought there should be a statue to the firemen who saved the Minister. After the night of 30 December I say three cheers to that. To read an account of the 1984 fire see Vidimus13.